The most popular way to explore the Portal is to use the various search functionalities it offers. This chapter gives explains with the help of illustrated examples how to perform simple keyword searches in the Portal. When searching the Portal, it is important that you make best use of the different search scopes it offers. In this first search example we examine Global Searches, that is to say searches that retrieve information from across all the Portal’s data content. You can perform a global search from the portal’s homepage. Simply enter a keyword or phrase into the search box provided, and click on “search”. Let’s look at the global search functionality in a bit more detail by way of an example. Say you are interested in refugees. 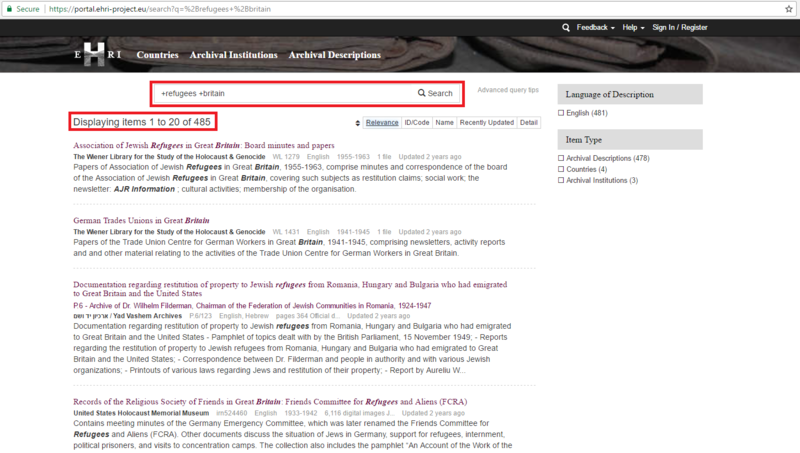 The easiest way of finding information about this topic in the Portal, is by entering “refugees” as your keyword into the global search box. The screenshot below, gives you the result-set as it would have appeared by February 2017 for such a search. 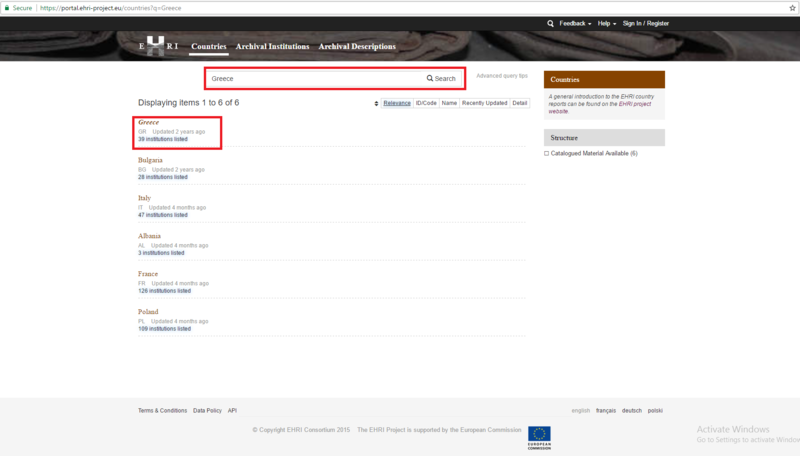 As you can see you are presented with a rather large number of results - 4,329 item - and the “Item Type” box on the right-hand side of the screen indicates that this total comprises 4,291 archival descriptions, 24 countries and 14 institutions. Clearly, the Portal holds quite a lot of information relating to refugees. 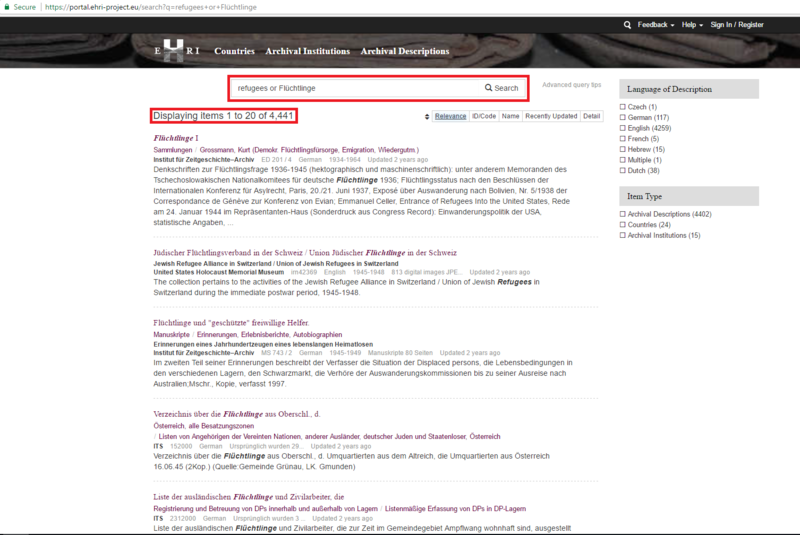 Indeed, our new search provides us with 4,441 results, and retrieves many more descriptions written in German. No matter whether we look for refugees in English only or in several languages, our result-set is rather large. Depending on what exactly you are looking for, this may not matter too much. Results are ordered by relevance which is computed by the search engine, and which, in many cases, ensures that the most relevant items appear at the top of your result-sets. However, when presented by a large result-set and when the first few items do not seem particularly relevant, you might want to think of refining your search. The section on “Scoped searches” in this Chapter, as well as Chapters 5 and 6 provide you with various options and examples on how you could make your searches more precise. Here let’s just briefly look at one technique, namely to enter additional search terms. Let’s assume that you are particularly interested in is the experience of people that fled to Great Britain during the Holocaust. After a search for refugees returned too many irrelevant results, you decide to try a search for Refugees Britain. Looking at the result-set, you are maybe surprised that you now have even more hits (4,746 rather than 4,441). This is because the search engine has now retrieved all descriptions that include either the term “refugee” or “britain”. However, this does not mean that your attempt to make your search more precise has been unsuccessful. In fact, if you look at the resultset more closely, you will see that many descriptions of collections that deal with refugees in Britain are now located toward the top of your result list. In other words, while the addition of Britain has widened your search, it has also improved the relevance ranking, and thus helped you to find the most relevant items more easily. If you want to make sure that you only retrieve items that contain both the words refugees and Britain, you can easily do this. Simply enter +Refugees +Britain into the search box (for more details on the +-operator, see Chapter 5 below). As you can see, you now end up with a much tighter and manageable result-set of 485 items. Rather than searching across everything, the portal also offers you the possibility to search within defined smaller subsets of information. For instance, you can decide to limit your search to one of the three main categories of information (countries, archival institutions and archival descriptions). To do this, select the appropriate category from the menu-bar, and then perform your search using the search box provided. 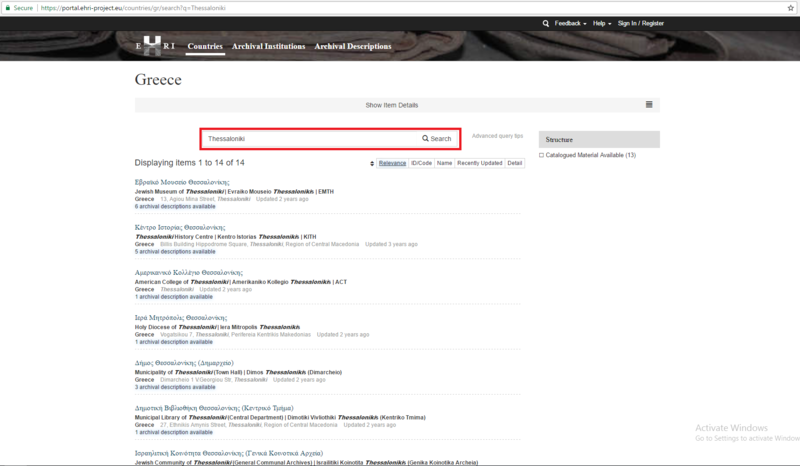 Further scoped searches may be possible once you view a description of a country, archival institution or archival holding. As explained in chapter 2 above, the portal has a hierarchical structure (countries -> archival institutions -> archival descriptions at varying hierarchical levels), and portal searches can be scoped to any level within this hierarchy. Thus, if you look at a country report, you can search through all the archival institutions located in this country. Likewise, starting from the description of a institution, you can limit your search to descriptions of archival holdings of this institution. If you are looking at a multi-level description of an archival holding, finally, you can successively search through the lower levels of this hierarchy. The following example illustrates how you can make use of scoped searches. Say that you are planning a research trip to Thessaloniki in Greece and that you are interested in finding archival information about Greek Holocaust survivors. 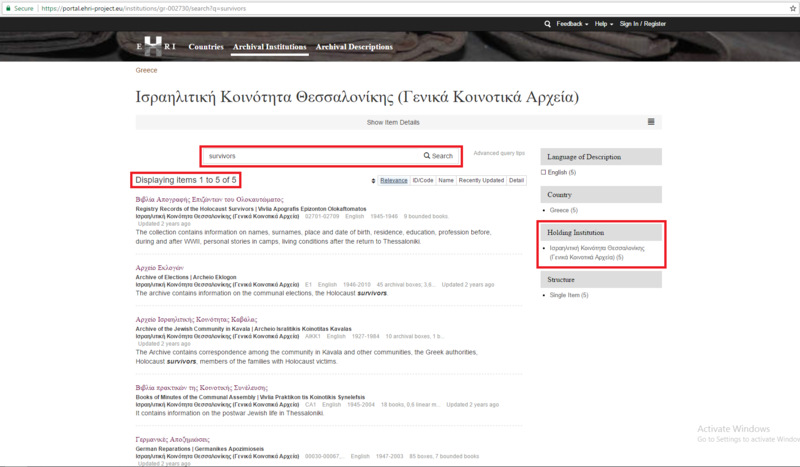 You want to use the Portal to find archival institutions and holdings located in Thessaloniki that might be of interest to you. On the portal homepage, click on the “Country” link. You will be redirected to the countries search page. Type “Greece” into the search box provided. Enter “Thessaloniki” in the search box provided. The result-set will list all Greek archival institutions that mention the term “Thessaloniki”. (As of February 2017, you would have thus retrieved 14 institutions). To see which of these institutions might be relevant to your research about Holocaust survivors, simply click on their names, which redirects you to a description of the selected institution. For some institutions the information provided under the heading “Archival and other holdings” might be sufficient for you to establish whether it is likely to hold relevant collections, for others you might additionally want to search through their more detailed descriptions of archival holdings. As was the case with locating a list of institutions in the country report, you can find a searchable list of described archival holdings at the bottom of the description for each institution. 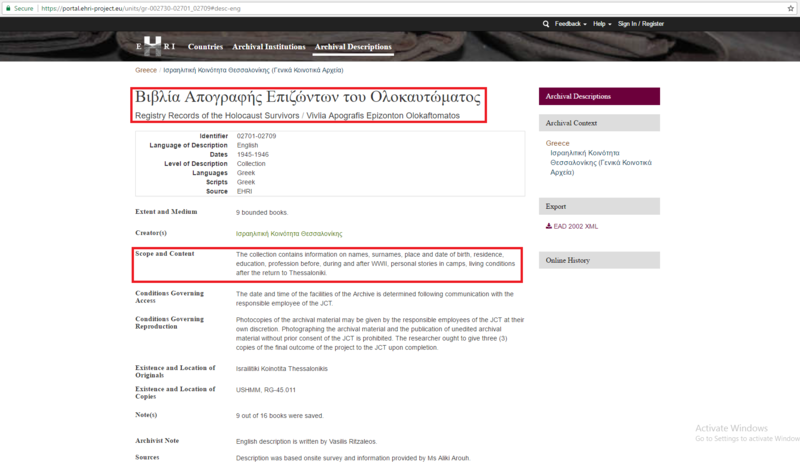 For instance, if you look at the description of the “Jewish Community of Thessaloniki (General Communal Archives)”, you can see that EHRI has, as of February 2017, identified and described 9 collections held at this institution as Holocaust relevant. Enter the term survivors into the search box provided. As you can see, this terms appears in the descriptions of 5 collections held by the Jewish Community of Thessaloniki. Open the retrieved descriptions of archival holdings to access more detailed information about their relevance. 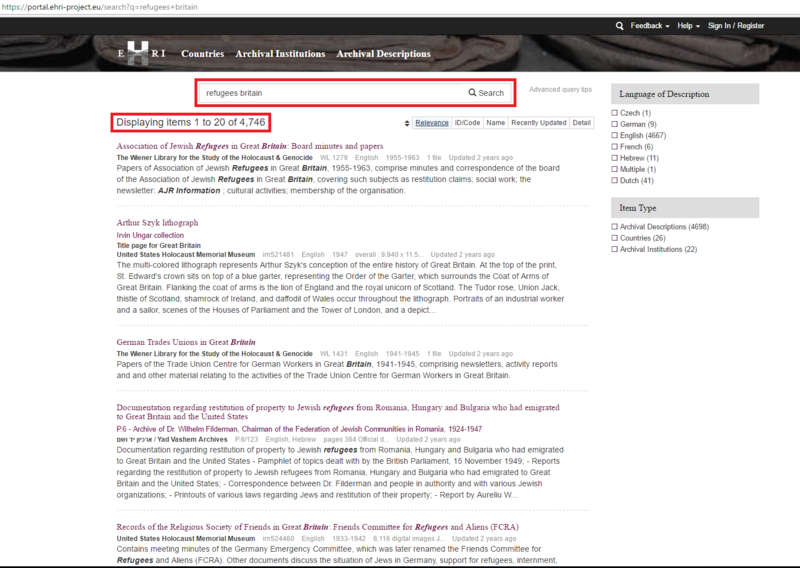 For instance, if you look at the “scope and content” information of the collection “Registry Records of the Holocaust Survivors”, you can easily see that it will be relevant to your research. Make sure that you take note of relevant institutions and holdings that you have identified. For archival holdings, noting down the “Identifier” would be particularly useful, as it will help you to access the collection when you visit the archive. Alternatively, if you’re a registered user on the portal, you could also bookmark selected descriptions by “watching” them (see Chapter 9 below on how to do this).